The M.V. Pan Acacia was left with a hole in its bow after it was struck by a vessel heading to get fuel. The Transportation Safety Board says it's still investigating whether a collision between two freighters in Vancouver Harbour early Sunday morning was the result of human error or a mechanical problem. TSB marine investigation manager Mohan Raman told CBC that the M.V. Pan Acacia had a 20 centimetre hole torn in its bow when it was struck by the M.V. Caravos Harmony. At the time of the collision, the Caravos Harmony was heading to a bunker station to fuel up. it was under its own power and was being operated by a pilot. The Pan Acacia was at anchor. "There's a big hole on the side of the Pan Acacia that needs to be repaired, though it is above the waterline," said Raman. No one was hurt in the collision and there was no reported pollution. Raman said the Pan Acacia is a double hulled freighter and was empty of cargo when it was hit. The Caravos Harmony was not damaged. Raman said he didn't know if it had cargo aboard. According to MarineTraffic.com, the Caravos Harmony has left Vancouver for Incheon, South Korea. The Pan Acacia remains anchored in Vancouver Harbour. Raman said both vessels would need approval from Transport Canada to leave. "If they allow [the Pan Acacia] to go elsewhere for repairs, they would have to give clearance first," he said. 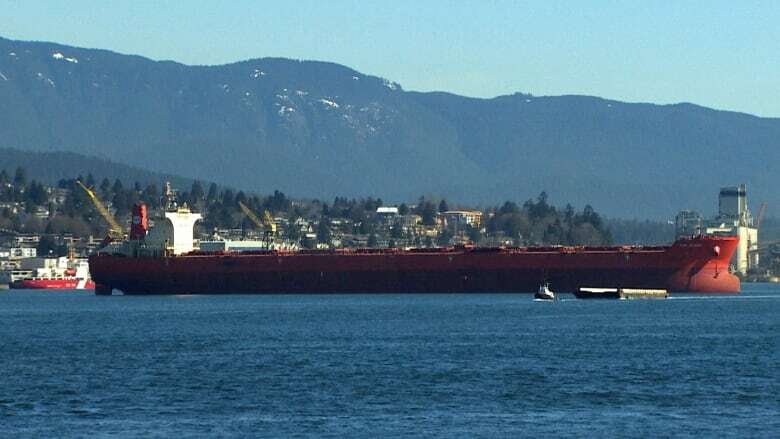 The collision has raised questions about Vancouver Harbour safety, especially with oil tanker traffic through the waters set to increase by approximately 10-fold upon completion of the Trans Mountain pipeline expansion project. But Raman said he doesn't believe this incident means there's cause for concern. "I don't think it's unsafe. Ships come in and out all the time and there are separate channels for them to travel in," he said. "So it's not a free-for-all inside Vancouver Harbour. It could just be one of those things." It's not known how long the TSB report will take to complete. The M.V. Caravos Harmony is registered in the Marshall Islands and is listed as a 2013 bulk carrier. The M.V. Pan Acacia is a 2010-built cargo ship with Panamanian registration.